The response was clear. Eighty-four percent of U.S. households agreed that continuing these incentives should be a national priority. Agreement was higher (88 percent) among households owning defined contribution (DC) accounts or individual retirement accounts (IRAs), but more than three-quarters of households without such retirement accounts agreed. Here’s how the survey numbers break down. Note: The sample is 2,968 households, of which 1,869 owned DC accounts or IRAs and 1,099 did not. In response to other questions, 85 percent of all U.S. households disagreed with the idea of eliminating the tax advantages of DC accounts, and 83 percent opposed any reduction in workers’ account contribution limits. Households also indicated they appreciate many other features of DC plan savings, in addition to the tax incentives. A vast majority of households with DC accounts indicated that their plan offers a good lineup of investment options and that payroll deduction made it easier to save. 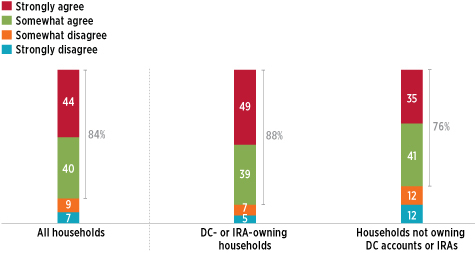 Results from our recent survey of DC plan recordkeepers confirm this commitment to saving: in the first three quarters of 2011 only 2.2 percent of DC plan participants stopped contributing to their plans. You can find the full report, along with other studies and related materials, at our 401(k) Resource Center.